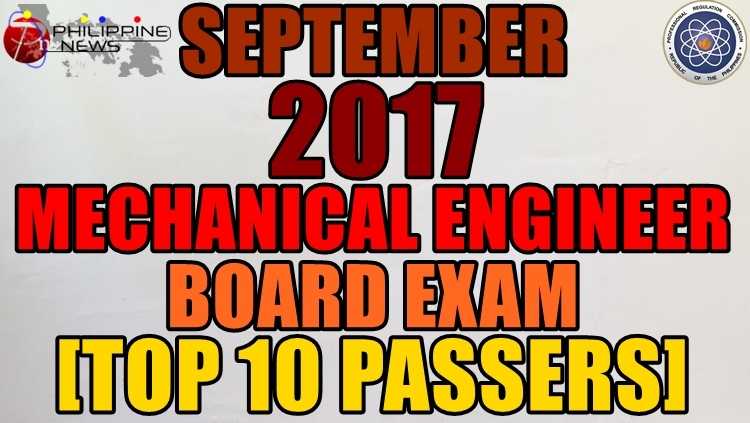 The results or the list of passers of the September 2017 Mechanical Engineer Board Exam as well as the Top 10 Passers and Top Performing and Performance of Schools will be available on this website as soon as released by the Professional Regulation Commission (PRC), two (2) working days after the last day of the examination. The September 2017 Mechanical Engineer Licensure Examination was administered by the Professional Regulatory Board of Mechanical Engineering headed by Chairman, Engr. Jesus M. Redelosa and members of the board namely Engr. Fernando S. Guevara and Engr. Mirardo C. Malazarte, Jr., on September 28-29, 2017 at various testing centers in the country. The results of September 2017 Mechanical Engineer Board Exam is expected to be released in two (2) working days after the last day of the examinations or on October 3, 2017. However, the list of passers may be released earlier or later without prior notice from PRC.